* CELTIC PODCAST NEWS: Last week, I informed you about the free Irish & Celtic Music Podcast app. I was quickly notified that app needed updating. I have forwarded that info on to Libsyn. It should be updated soon. My apologies for that. I'll let you know as soon as I hear there's an update. If you are not on Android or iOS, I'm checking on options there as well. * I want to send out a big thanks to the patrons of the podcast. Your generous pledge of as little as $1 per episode pays for the production of this podcast as well as my time in producing the show. You will enjoy a personal podcast feed where you can listen to the show before regular subscribers, occasional extended editions of the show, and my deepest thanks. When we hit a milestone, you get a 2-hour special. We are just $12 away from the next 2-hours special. Thanks to our newest patrons: Brian Z, Gary R Hook, Jason Roberts, Nicole Theresa, plus Annie Lorkowski, and Bill Shields who raised their pledges. Thank you all for your generosity! Become a patron today! Merbs Labrador posted on Facebook: "Hey mark, it's merbs! I'm originally from the Philippines. living now in New Zealand.. I really love irish & celtic music. I discovered your podcast through the celtic roots podcast with raymond in belfast northern ireland. It all started back 2011 when I was working in the desert, with lots of my irish workmates. I was inspired and got addicted to listening to celtic music. Best of luck to your program, I'm lookin forward to be one of your patron. Cheers"
Ma-Ho-Ney posted on iTunes: "Great music, love the themes! I am making my own top music playlist based off of the songs I hear on the podcasts. I used the detailed podcast descriptions to identify the artist and songs and then get them from iTunes! A lot of great music, artists and free stuff! Worth subscribing, and not just around Saint Patrick's Day! Martha Meyers emailed a picture: "Boo for just making apps for the robot and the fruit. Your developer should look into resources for easily porting iOS apps as Universal Windows Apps. Now that’s done, attached is a pic of the blanket I mentioned in the comments for show 291." 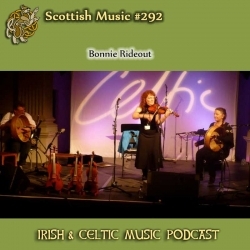 37:00 "Drummond Set: Miss Drummond of Perth/Louden's Bonnie Woods & Braes/The Devil in the Kitchen" by Caledonia Swing from Something Like That!